NEW YORK ? An astronaut from New York returned home Thursdayto dedicate an American flag flown on the space shuttle to the victims of Sept.11. NASA astronaut Mike Massimino, who has flown twice on theshuttle to upgrade the HubbleSpace Telescope, presented the flag to the National 9/11 Memorial &Museum under construction at the ground zero site of the Sept. 11, 2001terrorist attacks. The flag was flown on Massimino's STS-125 mission of theshuttle Atlantis in May 2009. "We flew an American flag on our flight - it's prettycustomary to do that," he said. "I'm a New Yorker? The idea I had wasto give it to the city of New York to honor the Sept. 11 victims." Massimino said his six crewmates readily agreed. Theastronaut, who now lives in Houston near NASA?s Johnson Space Center, spoke atan event in New York City to preview preliminary footage from the Hubble 3D IMAXfilm, set to premiere March 19, which will chronicle their trip to the spacetelescope last year. The newly-dedicated flag is on temporary display at the 9/11Memorial Preview Site. Plans call for the museum to be completed by Sept. 11,2011. "This morning I got to return it down to the WorldTrade Center site," Massimino said. "As of today, that's on displaydown there." This flag is the second that Massimino has donated in honorof Sept. 11. In August 2009 he presented another American flag flown to Hubble inhonor of firefighters who died that day, and their families. The astronaut'slate father was a New York Fire Department fire inspector. 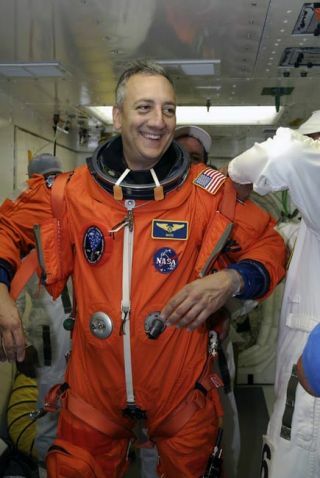 Massimino regularly posts Twitter updates about his life asan astronaut under the name Astro_Mike. He is a veteran of four spacewalks, allof them to overhaul the Hubble Space Telescope.